﻿ Handy Library Manager, tutorial: check in/out, use looup drop-down lists. Help, how to topics > Circulations (check in, check out, reserve, renew) > How to set a lookup option? How to set a lookup option? How to check an item out manually, (selecting items and borrowers from drop-down lists)? There is a new option in the Check I/O window (version 2.4): Item/Borrower Name Lookup drop-down boxes. Small libraries that don't use barcode scanners will have easy access to item and borrower selection. 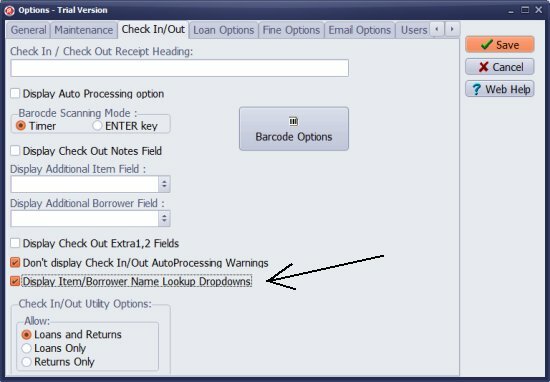 In this topic we explain how to turn on Display Item/Borrower Name Lookup Dropdowns. In the Options/Check InOut select Display Item/Borrower Name Lookup Dropdowns. Name Lookup (1) is displayed in the borrower section. 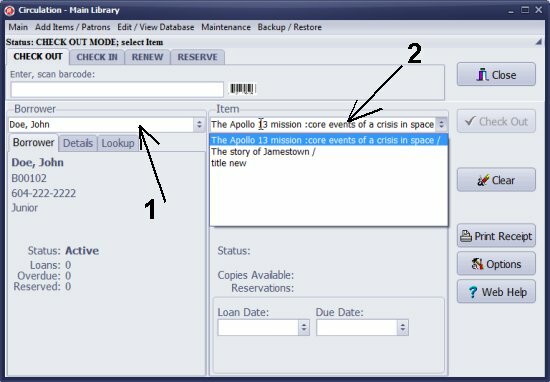 Entering a character into the Borrower lookup box will result in the immediate action: displays borrower's names that start with letters entered. Item Lookup (2) is displayed in the Item section. Entering a character into the Item lookup box will result in the immediate action: displays item's titles that start with letters entered. Too many letters entered into the box? Use Back (Backspace) keyboard button to move one letter back.